Big-bodied, white ewe with really strong growth and good milk scores. Moderate prolificacy, though this girl may sometimes have triplets. 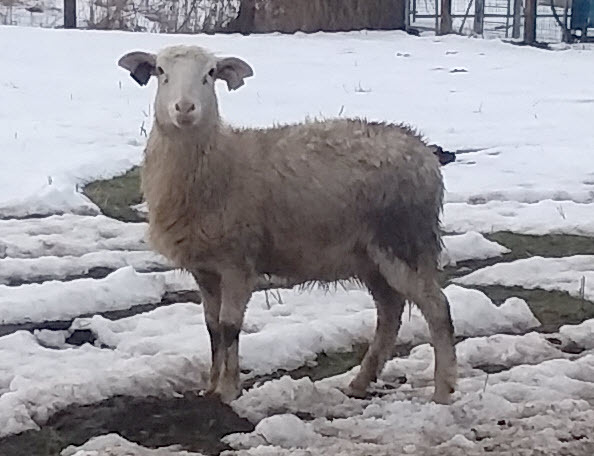 She’s got Aspen Mountain (Montana) and Birch Cove (Missouri) genetics behind her, as well as Misty River, now retired from sheep. Photo taken Feb 2019. EBVs from Dec 2018 lamb crop data. 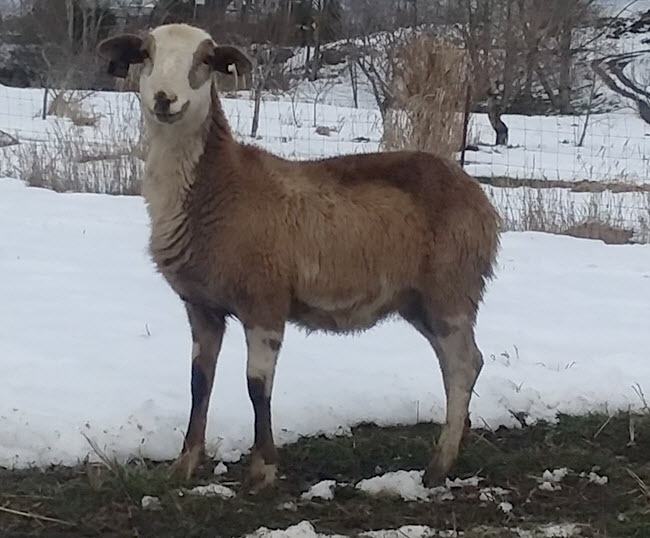 This girl is ready to grow out and breed this fall, to lamb as a two-year-old. A very nice heavy-bodied, tall white ewe. Good growth and prolificacy, a little lower on milk, but she will likely mostly twin and will raise them well. Photo taken Feb 2019. EBVs from 2018 lamb crop 120 day weight data. 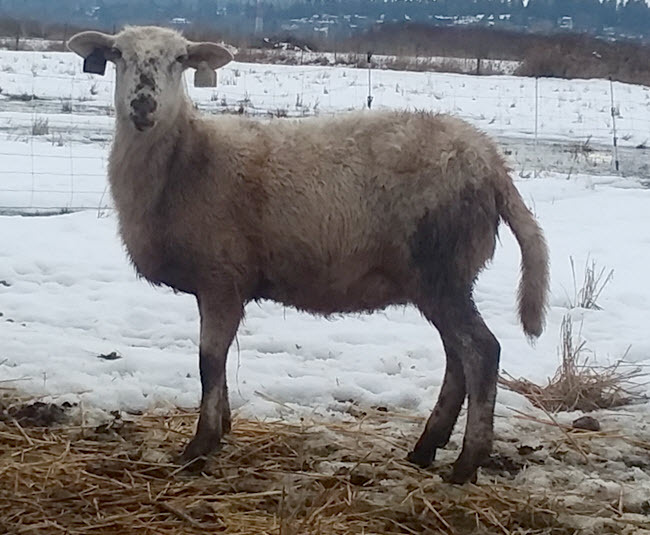 This ewe is ready to grow out and breed this fall, to lamb as a two-year-old. A tall white ewe with classic lines. High EBVs across the board, including birth weight and maternal birth weight, so this girl could have inconveniently large lambs if overfed during pregnancy. 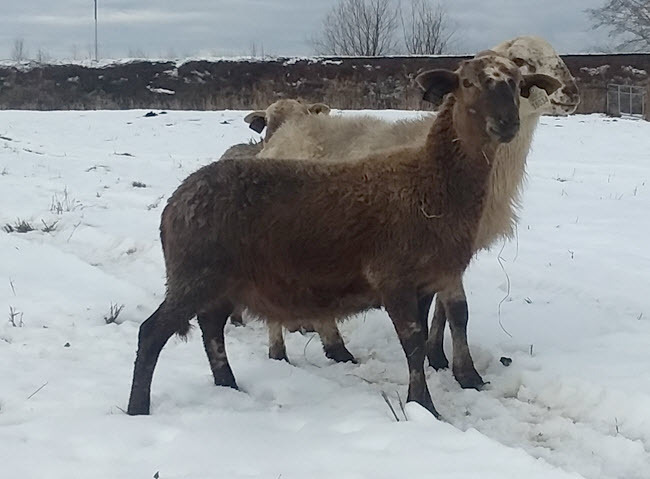 But for pounds-per-ewe-weaned, this girl is very strong, likely to hover in the twin/triplet range with good-growing lambs fed by a very rich milk supply. EBVs from Dec 2018 lamb crop data. Photo taken Feb 2019. 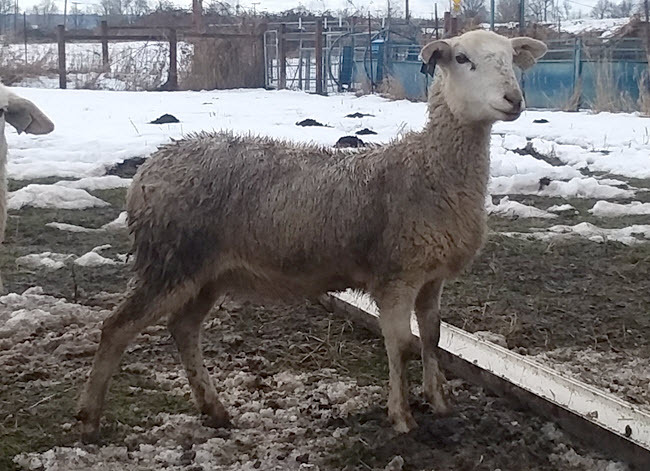 This ewe is ready to grow out and breed this fall to lamb as a two-year-old. Stocky white ewe with a splash of red down one shoulder. Good growth and milk scores, very high prolificacy, this girl’s maternal side has triplets galore, and good survival genes. Photo taken Feb 2019. EBVs from 2018 Dec 2018 lamb crop data. 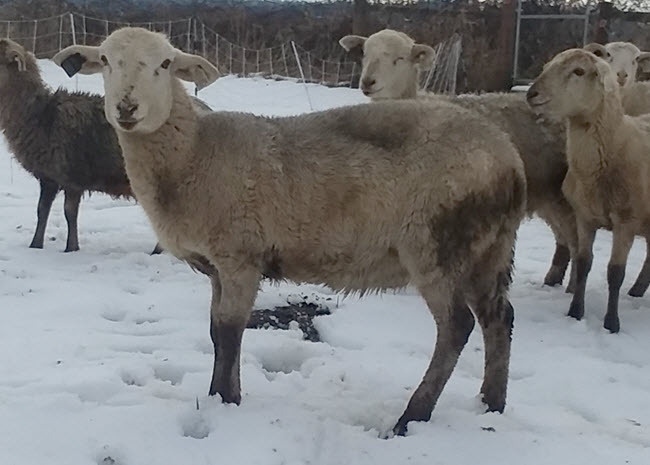 This ewe ready to grow out this summer and be bred in the fall to lamb as a two-year-old. Stocky ram with very flashy markings, good growth EBVs, modest on maternal traits. He would be a good terminal sire for producing fast-growing butcher lambs. Photo taken Nov 2018. EBVs from 2018 Dec 2018 lamb crop data. This ram is ready to go to a new home and breed this year! Stocky, white, classic ewe with very strong growth and milk. 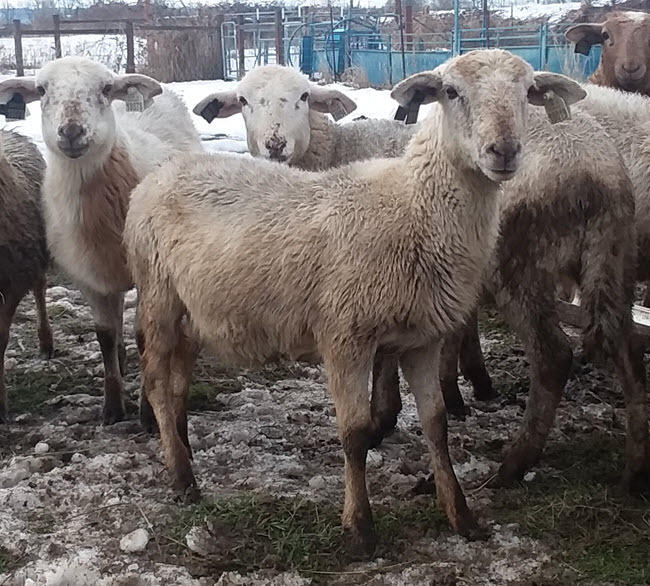 Moderate on prolificacy, she is likely to be a solid twinner with good-growing lambs. 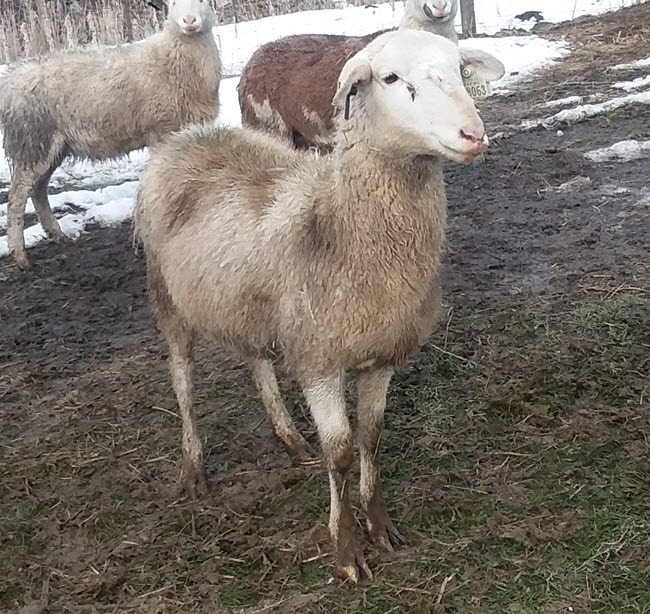 A pretty and refined ewe with a beautiful outline. Her EBVs are good, though she’s a little weaker on milk. She should be a solid twinner that raises fast-growing lambs. A nicely structured white ewe with a short hair coat. 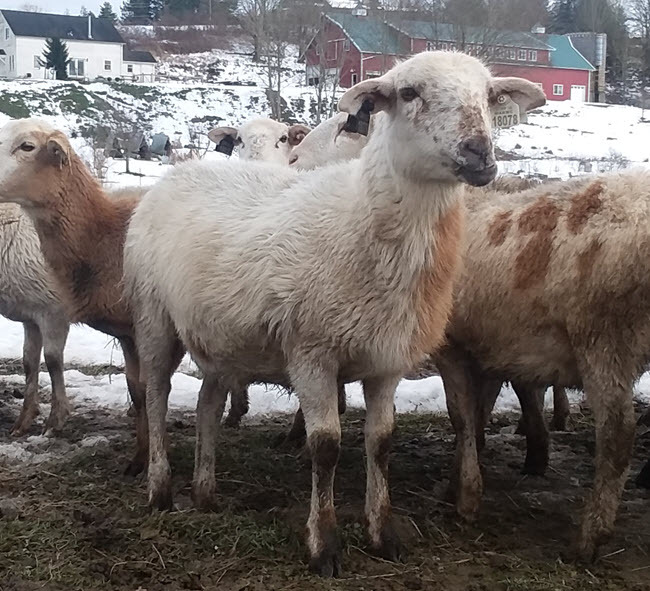 Her EBVs are modest but positive and balanced, she will likely be a very standard-producing ewe. She comes from a mixed pedigree for prolificacy, dam line has quite a few triplets, sire line not so much, so she could go either way. Tall, buckskin ewe with flashy markings and a panda face. Very strong growth and milk scores, lower on prolificacy, so she will likely steer away from triplets. Photo taken Feb 2019. EBVs from Dec 2018 lamb crop data. 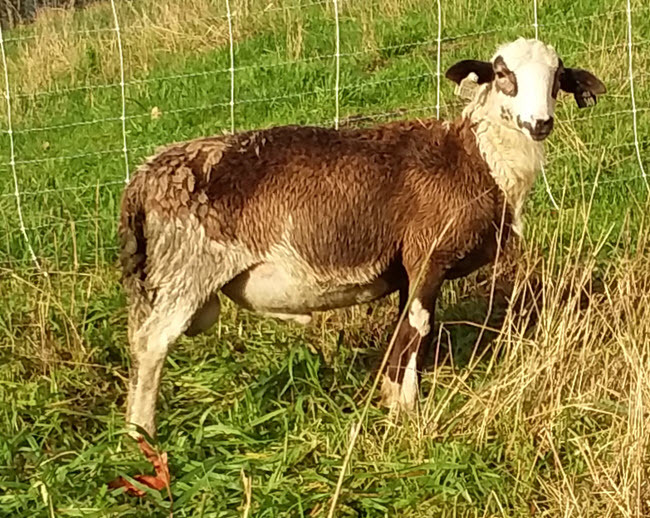 This ewe is ready to grow out and breed this fall to lamb as a two-year-old. A nice, heavy-bodied ewe with long neck. Chocolate with a brockle face. Really good growth and milk scores, but more moderate on prolificacy. She has a mix of lower and higher NLB animals in her pedigree, being a triplet herself, but this pedigree averages away from triplets in general. This is a working farm, and also our home, so it's hard for us to accommodate drop-in's! Copyright Canfield Farms 2008-2019. No content or images may be reproduced without permission.